How To Boost Your Metabolism Naturally and Quickly. Increase your energy and your fat burning capacity by speeding up your metabolic rate with these free tips. Although metabolism is commonly discussed and included as a part of the fundamental information required when it comes to losing or managing weight the truth is that most people do not understand how to speed up their metabolism. This is partly because there is so much information available about metabolism that it becomes misconstrued. As it is told from one resource to another and passed along from friend to friend the facts seems to get lost in the message. Additionally, some people believe that when they gain or lose weight it is always due to a metabolic change. This of course is not always the case. There are times that a person’s metabolism is totally responsible for a weight fluctuation but not always. The good news is that there are ways to increase one’s metabolic rate, which means the body will burn more calories. The purpose of this report is to teach ways to do just that and also to dispel some of the misconceptions related to metabolism and weight loss. With that brief introduction let’s get started! As I mentioned earlier, we have not received consistently accurate information related to metabolism. The weight loss industry is a big business with many sub-categories. Consider for a moment the many food, supplement and exercise companies on the market. If you learn the truth about metabolism and put it to use many of those will lose lots of money, in fact, some will go out of business all together. It is not surprising that we hear both fact and fiction when it comes to metabolism. Metabolism can be explained in very simple terms, it is the process the body uses to convert food into energy. Every function of your body depends on metabolism to some degree. The body is a well designed system in which every system works together. Each system depends on the other to function properly and at its best. If there is a problem in one area there is generally an impact in another area to a greater or a lesser degree. You can think of this as the same way a car functions. For example, although you may be able to drive a car that needs air in the tires you will be using more gas than is necessary and eventually if you do not attend to the problem you will ruin your tires. An exaggerated problem could even escalate to the point of ruining the wheels or rims. Now back to metabolism. Your body is always generating new tissue and cells to replace dead, dying or weak cells. The process of creating new tissue or cells is a part of the metabolic process and it is called anabolism. The other part of metabolism is the breaking down of energy so that the body has fuel for the functions it needs. The breaking down process is called catabolism. It can be thought of as the opposite of anabolism. An example of catabolism is perhaps you are hiking and your body temperature rises and your heart rate increases. At this point your body needs more oxygen and you need more energy. Your body will automatically begin converting (breaking down) food, or calories, into energy. So essentially metabolism consists of two completely opposite functions. These conflicting functions work together, in harmony, to create cells and to break down calories. The breaking down of calories to create energy for the body provides the direct relationship between metabolism and weight management. In order to truly understand this relationship it is important to understand more about what the word calorie means. When you look at a food label you can find the number of calories listed per serving. But what exactly is a calorie? Calories are units of measure and they measure energy. With that definition it would seem the more calories per serving the better, but we all know that is not true. So what is missing from the definition…what else do we need to know? Let’s compare calories to inches. Does it matter to you if you are measuring inches of cloth or inches across your desktop? What I mean is, if you end up with 55 inches you still have 55 inches, right? Inches are inches and if you are working with the figures say in a calculator it really would not matter if it was related to your desktop or if you were working on a dress pattern, the 55 inches would be the same. But of course you cannot do the same things with 55 inches of your desktop that you could do with 55 inches of cloth, right? Okay, similarly the body does not care if you consume calories (or energy) from fruit and vegetables or from cake and ice cream. To the body a calorie is a calorie. Once consumed the body will find a use for it. Remember the two functions of metabolism…to build or create and to break down? Okay, if you consume the cake and ice cream you will have consumed more calories than the body can use at the time, so it will not need to break it down at that time. Can you guess what will happen to it? I am sure you can! The calories will be turned into cells (anabolism). This is where the weight gain comes in. The really bad thing is that this will usually be transformed into fat, but not always. And as a matter of fact, people with muscular tone burn calories without doing anything; their metabolism is working overtime for them. Well now that I have mentioned muscles I might as well move on to the topic of exercise. I know many of you do not like to exercise. The bad news is that unless you happen to have an unusually high metabolism rate you will need to give it a kick start to get it where you want it to be. Aerobic exercise is the best for this. Aerobic exercise will increase your heart rate, blood circulation, body temperature, and oxygen intake/carbon dioxide exchange. All of which will mean increased catabolism. As I mentioned before, muscles tend to keep your metabolism rate high simply because muscles cells are constantly being regenerated which means calories are being burned. Simply put, muscle building is a great way to boost your metabolism! That’s right; your body will be burning more calories all the time – without you doing anything extra. All you have to do is build some muscles! You can even be sleeping and your body will be burning calories! Okay, so we’ve talked about aerobics and muscle building, now I want to add interval jolts. Sometimes you hear this called “interval training”. I’m referring to doing something unexpected during your workout routine for a short period. Do something to give your body a little jolt. For example, if you jog then perhaps you could add a true run for a short distance. During that time your body will be forced to burn more calories than usual. Give it a try. Just throw in quick bursts of something a little more strenuous and you are sure to see results more quickly. Adding variety to your workouts also helps to increase the metabolic rate. A great idea is to spread your workouts out. For instance, if you dedicate one hour per day to working out, instead of doing the complete workout in one block of time consider doing two thirty minute workouts or even three 20 minute workouts. The point is that with each work out you will stimulate your metabolic rate and if you spread your exercise routine out your metabolism rate will be higher throughout the entire day rather than only during a one or two hour block of time. By spicing up your exercise routines with variety you are less likely to get bored and you will gain the additional advantage of keeping your body from getting into a regular groove which would mean that you would not get the maximum results from the metabolism. Your lifestyle, or rather, the way you live on a day-to-day basis is very important when discussing your metabolism. Undoubtedly you will begin thinking that your life is full enough as it is and that you have little time left over at the end of the day. You will wonder how on earth you could possibly add another activity to your already chaotic life. Relax! When discussing lifestyles I am referring to small changes that can be made that will not necessarily have an impact on how you live life but rather on the impact that life has on you. One such example would be a person that routinely opts to eat low-fat and low-calorie meals but drinks wine with his or her meal. Did you know that drinking alcohol with a meal can encourage overeating? Not only that, but alcohol itself contains calories that the body has to deal with in one way or another. Here’s another basic lesson in metabolism; getting enough rest actually improves your metabolism rate! Yes, I know, you must sometimes make choices and some people give up rest in order to exercise. Life can be tough! The good news here is that it is not necessary to work out daily – or every night if that is the case. Also, it may be possible to find other times that you can fit in a little exercise so that you do not have to give up sleep in order to exercise. Consider using part of your lunchtime or the time right after work. Other options include finding ways to incorporate exercise into your daily activities. For example, use the stairs instead of the elevator and park at the far end of the parking lot. You may or may not have realized this before but dealing with stress can cause a lot of problems besides the mental issues. Stress can actually send signals that create more fat cells and a slower metabolism. This is definitely not what we are looking for. Although none of us can completely avoid stress in our lives there are ways to minimize it. First of all, do whatever you can to avoid stressful situations and people. Some people are simply negative-minded. Do your best to find the positive in any given situation and to be a positive-minded person. Then avoid all negativity that you can. Also find ways to pamper yourself. If a soak in the tub is soothing to you then soak in the tub. Or perhaps you enjoy music or scented candles. Relaxing herbal teas also help to calm you down during busy days. Whatever it is that matters to you give yourself those small pleasures in life. Find ways to de-stress; find out what works for you. Be nice to yourself and make your life as nice as you can make it. Also, remember to reward yourself for every small triumph along your journey to weight management. As we have already learned, our bodies work hard to use calories in an efficient manner for us. And as we will sometimes eat the wrong foods our bodies have no choice but to do what they are designed to do and make the best of the situation; the calories will be stored. Additionally, if you decrease the amount of calories that your body receives your body will respond by slowing down its metabolism. You see, your body will essentially go into survival mode and try to make the limited number of calories last for as long as needed. 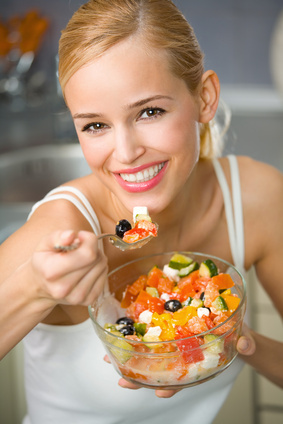 A great plan is to eat several times a day but eat smaller portions and eat the right foods. What do I mean by that? Well after reading this far you can probably guess; I am referring to foods that are high in nutritional value. If you eat more than three meals a day, let’s say 5-7 meals per day, you will be unlikely to snack on unhealthy fattening foods. Plus you will not reach the point of feeling ‘hungry’ so you will not feel pressed to grab the first thing you see. That means you are more likely to stick with the better food items when you do eat. Perhaps even more importantly is the fact that if you eat often throughout the day you will keep your metabolism rate higher. And that is really what we are after when we are trying to manage our weight or trying to lose fat. This entire plan of eating more to lose more must begin with breakfast – even if you are not a breakfast person. You see, your metabolism slows down while you are sleeping. It will not get that needed jolt until you either begin exercising or eat. And believe it or not, eating is the preferred method of waking up your metabolism. With this system of eating more to lose more it is imperative that you plan your meals ahead of time. This will prevent the problems associated with the last minute quickie meals that tend to be higher in fat content and calories. Another important point is that you should keep a food journal or food diary as they are sometimes referred to. Here you will document everything that you eat and drink plus some additional information. This will prove to be helpful throughout your weight loss journey. So you have now completed this report – congratulations – you have graduated from having misinformation to having more knowledge than most people about how metabolism works! Now it is time to put this information to work. You have the knowledge and that knowledge gives you power. Boost your metabolism so that you can lose the fat and get to the size that you truly want to be. You can then stop hiding in those oversized clothes and start wearing clothes that show off the new slimmer you! Remember, by changing your lifestyle slightly, and adjusting your diet and exercise you will be healthier from now on! Have You Started Exercising Yet? If you are having trouble getting started on your exercise plan, or not being able to stick to you, these tips will help you. There will be some days that you won’t feel like exercising. When this happens make yourself go out, even if you tell yourself it will only be for a few minutes. Once you get running or walking you will feel much better and will find that you will complete your regular routine. By putting it off until later, you are setting yourself up to miss an entire day. You don’t want this to happen unless you are really sick. Aim to not miss more than two days in a row without exercising. As you start to feel the benefits of exercise you will start to look forward to your daily exercise routine. You are doing great so far, I’d love to hear from you with your results. Feel free to drop me a note if you like. I hope that you have found this section on How To Boost Your Metabolism to be helpful and useful to you. Visit our HOME PAGE if you would like to learn how to do more in various health subjects like this.